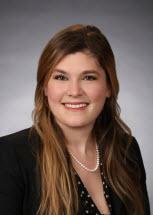 Diana A. Woodcock joined the firm in January 2019. Her practice is concentrated in Oil and Gas Title Examination. She was admitted to the State Bar of Texas in 2016. Diana received her B.A. in Neuroscience from Vanderbilt University in 2013 and law degree from SMU Dedman School of Law in 2016. In 2015, she became registered to practice before the United States Patent and Trademark Office. Diana is a native Texan and moved to Midland in 2017 with her husband. She is happy to call West Texas her home. Stubbeman, McRae, Sealy, Laughlin & Browder, Inc.
Stubbeman, McRae, Sealy, Laughlin & Browder, Inc., is located in Midland and serves clients in Odessa, West Texas, Eastern New Mexico and throughout the Permian Basin.